As beautiful as Turnberry with more exciting topography. Grossly under-rated, the holes are generally as impressive as the scenery. A great course with magnificent scenery. The only weak hole is, surprisingly, the 18th. Play four holes here at Rosses Point - as it is often known - and you come to 'The Jump'. It is the most memorable aspect of the round and one that will stay with you for years afterwards. The Jump is the par-5 5th hole whose tee is on the last part of the opening section which is on the high ground by the clubhouse. Way down below stretches another land - a sort of flood plain that is covered with humps, bumps, bunkers and greens. Drive the ball into the horizon, let it fall and the adventure that is a round at Co Sligo really begins. Played in the wind, it is a fearsome test. 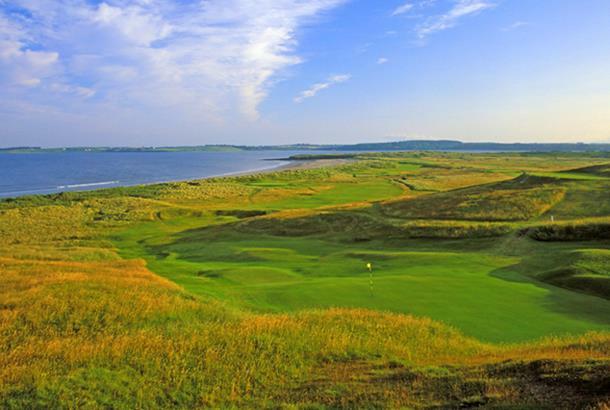 County Sligo Golf Club is one of Irelands great Championship Links located on the Rosses Point peninsula, 6km from Sligo. Established in 1894, the original 9 holes course was laid out by George Coombe. A decade later Captain Campbell extended the course to 18 holes. Green Fees 18 Holes Monday to Sunday €95.